TEN years ago The Blue Water, Wadduwa opened the doors to the public to appreciate intelligent luxury designed by the most famous Geoffrey Bawa. This is the last piece of work by the legendary Architect the late Geoffrey Bawa. The Blue Water was built on a coconut estate in a little unheard of village called Thalpitiya close to Wadduwa and now The Blue Water has become a landmark not only in Sri Lanka but globally. The design of this lovely hotel has been very minimalistic with a combination of nature and Architecture. The cross ventilation keeps you wrapped with a cool breeze all the time and the vast span in front of you when seated or standing anywhere gives you the feel of freedom and total relaxation. The ornamental ponds and the noise of water flowing will mesmerize and tickle your entire nodal system to make you feel rejuvenated. The colour combination with light shades and mostly brilliant white gives you that extra soothing comfort. A step out of the Hotel gives you a choice of the Village or the Ocean for the water lovers. Just one hour drive from Colombo to this recluse will make you feel five hundred miles away from home but still as close as one hour to drive back. 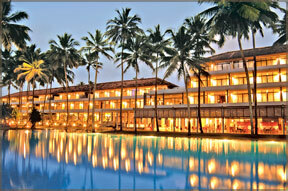 The Blue Water has completed ten years in the leisure industry with the signature on the world map of luxury hotels. The Blue Water has 96 luxury rooms and four suites with a sea view from every room. The palm studded garden adds that extra touch of an ambience of nature engulfed relaxation. 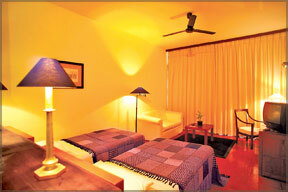 The rooms are bright as a child’s eyes and feels a sense of freshness. Every room has a balcony or a terrace to relax at your own time still gazing at the ocean. The main dining room is Admiral’s room located in the same level as the ocean. The Sunday Buffet is the most popular luncheon where the local community patronizes, which includes a dip in the pool, lunch and evening tea and cakes. The Sunday lunch is generally on reservations and most of the time it is sold out. The Saturday night Mongolian and the Barbecue has again been a sell out due to the spread. The Food and Beverage Manager Fazil Jamaldeen and the Executive Chef Nihal Nandasiri say the regular change of dishes of the daily theme nights has increased the dining crown as well as a good morale booster for the staff who see changes every day and gets involved in a learning process. The Port Hole Bar with its Pool table is certainly a good place to sit and sip through a beverage or a good cocktail. The Sea Board bar which is open on the sides makes you feel of a Garden Club. The entertainment is mostly in the evenings with live bands playing for listening or dancing. The Sunday Jazz Extempore starts at 2.00 p.m which helps to relax through the heavy Sunday lunch. The Blue Wave, Discotheque is open on Fridays and Saturdays for the young at heart. 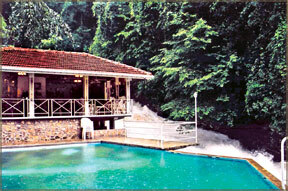 The Blue Water is also a popular place for Meetings , Conferences and large weddings or homecomings and even workshops. The ballroom can easily accommodate up to 300 guests. The plans are underway to enhance the banqueting department with an additional hall which would accommodate nearly 600 guests. The SPA is an addition to the hotel with an unusual building that houses it. The Chairman/Managing Director of the owning company, Union Resorts Ltd, Ajith Wijeyesekera says that plans are underway for a new property to be built in Sigiriya. The Blue Water team led by the versatile General Manager Roshan Perera who takes care of the property and a staff strength of nearly 300 says that the most important asset of the hotel is the team who are loyal and committed to the great success story of the Hotel. Glenross a plantation bungalow just half an hour away from Kalutara is also managed by The Blue Water. This beautiful colonial planters bungalow with it’s Georgian Windows, gables and stone walls was hand tooled by Ceylonese Artisans over 125 years ago. The quiet atmosphere is disturbed by the chirping birds who are nestled among the rubber plantation that surrounds it. The Blue Water is a property of Union Resorts Ltd., and managed by Jetwing Hotels, Jetwing House, Nawam Mawatha, Colombo 2. 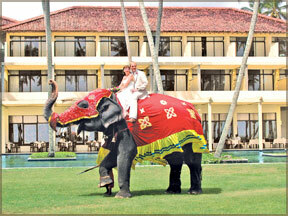 The Annual General Meeting of the Kandy Hoteliers Association was held at Mahaweli Reach Hotel,Kandy. The outgoing President - Raju N. Veerasingham of Grand Hotel, Nuwara Eliya presented his report for the year 2006/2007. In his report he mentioned about the training programmes which were conducted for the staff of member hotels and also the meetings held with Minister of Tourism, Milinda Moragoda, Faizer Mustapha - Deputy Minister of Tourism and Renton de Alwis - Chairman Sri Lanka Tourist Board. 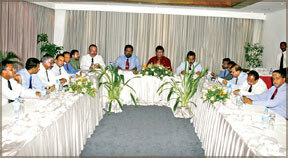 From left: Lalith Ellepola, Suresh Ratwatte, Hiran Seneviratne, Cyril Perera, Thusith Samaraweera, Roshan Perera, at the head table Rodney Armstrong, Timothy Paldano, Raju N. Veerasingham, Upul Leukebandara, at right Gamunu Srilal, Bathiya Gunasekara, Srilal Mendis, Stanley Goonaratne and Gamini Senanayake. He detailed the matters raised with the above dignitaries in the Tourism Industry pertaining to the problems encountered in the Kandy & Nuwara Eliya Regions. He also detailed the matters taken up with the Governor of the Central Province. He said that only some form of relief had been obtained on the closure of Bars in the Tourist Hotels especially on Excise holidays and also on the closure of Bars in Tourist hotels during the Kandy Perahera time. He expressed his disappointment that despite a Cabinet Paper to apply the same Electricity Tariff applicable for Industries to the Hotel Industry, this had not been complied with by the CEB. He thanked the member hotels for the support and the strength provided for a successful year in office. He also thanked the Secretary of the Kandy Hoteliers Association Suraj Perera and Treasurer Rodney Armstrong for a wonderful job done and for being live wires in the Association. He then invited Senior Past President Timothy Paldano to be the pro-tem Chairman to conduct the Election of office-bearers for 2007/2008. Timothy Paldano who was the senior most Past President of the Kandy Hoteliers Association present at the meeting, thanked Raju N. Veerasingham for being a proactive President especially during a turbulent period when Tourism was at a very low ebb. His constant dialogue with the tourism authorities deserved special mention, Paldano said. The Election of the Office Bearers followed and the following were elected to office. President - Cyril Perera - Hotel Hill Top, Kandy Immediate past President - Raju N. Veerasingham, Grand Hotel, Nuwara Eliya Vice Presidents - Thusith Samaraweera - Earls Regency, Kandy & Stanley Gooneratne - Hill Club, Nuwara Eliya Secretary - Upul Leukebandara - Amaya Hills, Kandy Treasurer - Rodney Armstrong - Mahaweli Reach Hotel, Kandy The AGM was followed by fellowship and dinner hosted by Mahaweli Reach Hotel Kandy. Set in lush wilderness with four guest rooms around a pool fed by a gushing mountain steam, is the Royal River Resort, Kitulgala. It lies at the end of a road that leads off the A 7 between Kitulgala Rest House and the Plantation Hotel, inland from the river close to the 38 km post. It is part of the group that includes Plantation Hotel and Hans Chandra in Mount Lavinia, but is so original in style it is unlike any other hotel in Sri Lanka. The road to Royal River Resort, called Beli Lena Road, passes through a small settlement with a furniture workshop before narrowing and winding uphill through rubber and tea plantations. Only someone with imagination and a flair for defying conversion could have thought of taming nature to build such a thrilling, unusual hideaway. It is amazing that this small, isolated and defiantly inaccessible hotel, with a cottage of two bedrooms, each with shower, and balcony overlooking the river, and two other beautifully designed guest rooms, functions with an alacrity rarely found in mainstream properties. Perhaps Royal River Resort is called Royal because the guest is king. Seafood from the catch of the day from the Indian Ocean, prepared exactly the way you like, by expert chefs of Galle Face Hotel. Its a “Sea Spray” Seafood fiesta at the Galle Face Hotel from August 21 - September 3 from 7 p.m. to 10 p.m. A complimentary beverage for every table of 10, is one of the many attractions at the Seafood Fiesta. Its a treat for all seafood lovers, lobsters, jumbo prawns, cuttle fish, crabs, marinated and prepared to your own taste, at the “Seafood Ensemble” at the “Sea Spray” restaurant of the Galle Face Hotel from August 21 to September 3. A Pie Promotion an unforgettable feast will be held at the Pastry Shop - La Patisserie de Paris of Ceylon Continental Hotel Colombo from August 24-31. Savour an array of mouth watering delicious Pies at the Pastry Shop from 9 a.m. to 9 p.m. during the fiesta. “This will be a sensational treat with mouth-watering fillings to suit your taste buds,” says Public Relations Executive, Onitha Gurugalla. Fresh juices such as Orange juice, Lime, Avocado, Pineapple, Mango and mixed fruit juices will also be available to quench your thirst at the feast at - “La Patisserie de Paris” during the promotion.